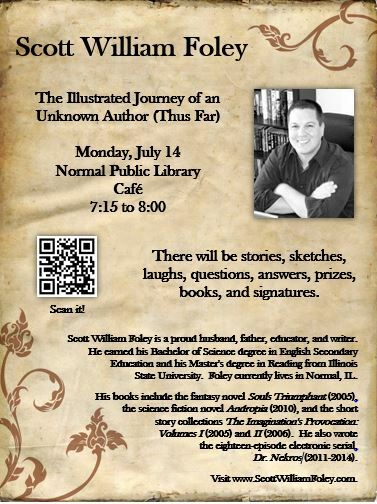 I want to remind everyone to join me at the Normal Public Library tomorrow at 7:15 p.m. We’ll have prizes, a presentation with sketches that will be given away, a question and answer session, and then a book signing. Though it says it lasts until 8:00 p.m., I’m more than wiling to stay until 9:00 p.m. I hope you see you there! In order to convince you to join me at the Normal Public Library on July 14th at 7:15 p.m., I’ve gone against my best judgement and created a video featuring yours truly. Remember there will be stories, sketches, laughs, questions, answers, prizes, books, and signatures at the event. This is a family friendly affair, so please do bring the kids. I’ll give away all sketches, and they will be on paper the size of a poster. Hope to see you there! PS – The first person who direct messages me with the subject “I want that!” will receive the sketch seen in this video. It will arrive by mail, so include your home address. PPS – Special thanks to my wife for filming this lunacy.